The man who co-founded One Nation, David Ettridge, is set to launch a serious court action against Opposition Leader Tony Abbott over his efforts to destroy them as a political force. 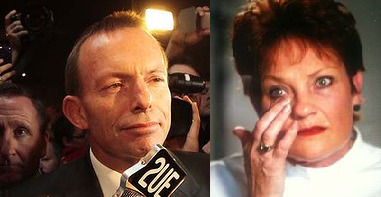 Abbott's actions led to he and co-founder Pauline Hanson ending up in prison for several months in 2003 — before the charges were overturned on appeal. The complaints made by Abbott destroyed One Nation, which at one stage looked set to challenge the Liberals as Australia's dominant conservative political force. Mr Ettridge says he has been spurred into action because he has great concerns that such an unprincipled person as Tony Abbott could, potentially, become Australia's next political leader. 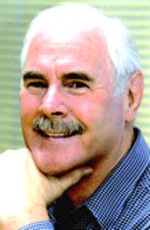 "I am greatly concerned that ... Tony Abbott, a man who had such little regard for the law and the democratic rights of Australians [in 1998] , could become Australia’s next Prime Minister," said Mr Ettridge, yesterday, in a statement. Mr Ettridge claimed that Abbott had committed several serious offences, including perverting the course of justice, crimes, electoral act infringements and a series of other wrongs. "Mr Abbott acted unlawfully in a number of ways in 1998 when he assisted and encouraged false and malicious litigation against the One Nation Party in the Queensland courts," he said. "The consequences of his unlawful maintenance of that unfounded litigation resulted in extensive damages that affected me greatly." Mr Ettridge claimed the offences Abbott alleged were always baseless, but were merely a malicious action to pervert the course of justice and provide political advantage for him and his party. "The false claims that were assisted by the Abbott sponsored litigation were baseless and were never an offence under the Queensland Electoral Act, yet in an effort to pervert the course of Justice, Mr Abbott provided lawyers, a QC and a barrister to propel those false claims through the courts." "It was a few years later that a thorough investigation by the Queensland Major Fraud Squad advised the Qld DPP that no offence had been committed and recommended the police investigation be dropped." Mr Ettridge says he will be claiming seven figure damages against Abbott and requesting, through the courts, that the until now secret donors to Tony Abbott's 'Australians for Honest Politics Trust' be at last revealed. "I will be filing a claim against Tony Abbott in the Brisbane Supreme Court seeking damages in excess of $1.5 million," said Mr Ettridge. "I will also be asking the court to compel Mr Abbott to release the names of the people who contributed to Mr Abbott’s ‘Australians for Honest Politics Trust’, so the trust can be fully examined for whatever contribution it made to any unlawful activity at that time," he said. "I will be alleging that those donors became co-conspirators in Mr Abbott’s unlawful actions and must also be held accountable. "Mr Abbott has closely guarded and never released details of this slush fund and was treated very lightly at the time by the Australian Electoral Commission who never pursued him to reveal such information. "The slush fund was quite obviously an associated entity of the Liberal Party and its conduct was limited to only attacking the One Nation Party, thus providing a benefit to the Liberal Party. ‘It also is possible that corruption could have existed between Mr Abbott and those trust donors who could have received or expected favours from the Howard Liberal Government at the time." "Until a full public disclosure and examination occurs, the question of corruption remains a possibility," said Mr Ettridge. For more details on this story, please read David Ettridge’s full media release. You can also see his legal claim here.